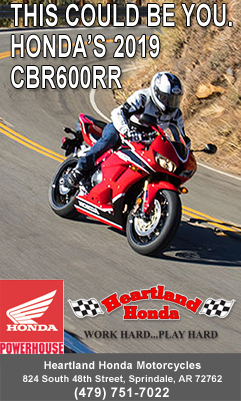 Even though it was pretty cold the last few months, the riding season is finally here and before you take your motorcycle on a road trip, spend an afternoon performing a thorough inspection of your bike. It’ll help keep it in optimal condition and prevent major repairs later on. Tires Look over your tires carefully. Cracks in the rubber, flat spots or nails and screws that may have punctured holes mean it’s time to get some new ones. Also, if you see exposed wire or metal meshing coming through the tread, it’s definitely time for some new rubber. If you don’t see any of these red flags, check the tire pressure and make sure they’re properly inflated. Belt or Chain A broken belt or chain can strand you at the side of the road. Take a few minutes to inspect them for wear and weak spots; replace the belt or chain if you find any damage. It doesn’t hurt to check the tension, either, and make sure it’s up to the manufacturer’s specs. 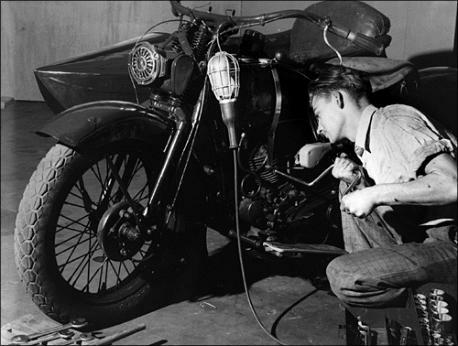 Spark Plug Depending on what type of motorcycle you have, a spark plug can be an easy roadside change. However, if you own something like a Suzuki S40, it’s best to check it beforehand. A spark plug change on that motorcycle is not a simple fix because the seat and gas tank need to be removed. A spark plug costs a few bucks, and it’s better to check and replace it now than wait for it to fail in the middle of your next trip. Air Filter Proper airflow into the engine ensures that it runs smoothly and efficiently. Filthy air filters prevent oxygen from entering the engine; thus the combustion process that runs your motorcycle can’t occur. Pull the filter out and hold it up to a light source. If you can’t see any light through it, you need to replace or clean it. Fluid Levels Stand up your motorcycle so it’s completely level to ensure accurate readings of the oil and brake fluid levels. Check the brake fluid first. Start by covering your gas tank with a cloth or towel because brake fluid can damage the paint. Most motorcycles have a little window on the front of the reservoir indicating the fluid level. If it’s on the low side, open the reservoir and top it off. Maintaining the engine oil level is, in my opinion, one of the easiest and most inexpensive ways you can prevent major engine repairs down the road. Low oil levels prevent proper lubrication. Lack of oil prevents parts from moving smoothly, which causes heat friction and can ultimately destroy your engine. Your local motorcycle mechanic will be more than happy to replace the engine but it may cost a few thousand dollars. Brakes Aside from checking the oil, taking a second to look at your brakes can save you a lot of money down the road, too. Letting your brakes wear down to the metal part of the pad destroys the disks, which can cost a pretty penny to replace. Most brake pads have a notch on the top to track its wearing. If you don’t see the notch at all, it’s time to replace the pad. Lubricate the Cables Over time, brake and clutch cables can wear down and fray. If either breaks, you’re in serious trouble. Look at your motorcycle maintenance book and figure out how to detach the cables from their housings on the handlebars. Once you can access the cables, apply cable lubricant and let gravity do the rest of the work. Lights It only takes a second to check that your signal lights, brake lights and headlights work. These lights communicate your moves on the road to other drivers and help you stay safe on the road. Now that the hard stuff is done, you only have a few more things to do. My bike gets kind of dusty from sitting all winter, so I always give it a bath and a thorough wax job before hitting the road. Not only does wax bring out the pristine, just-off-the-shop-floor look back to your paint and chrome, it also protects your bike’s paint job from the elements, helping it last longer. Lastly, make sure to check out all your riding gear to ensure it’s in tip-top shape. Worn boots, scratches on your helmet visor and holes in your gloves may not protect you as well or may even impede your riding abilities. Your gear is the only thing protecting your skin from the pavement. 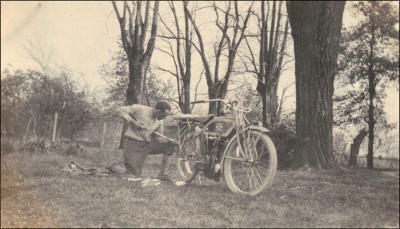 The least enjoyable thing about owning a motorcycle is getting stuck on the side of the road – especially if a little maintenance work could’ve prevented it. You can more than likely avoid that from happening by taking a few hours one afternoon and performing a thorough checkup on your motorcycle. Ride safely this season! Battery If you haven’t started your motorcycle all winter, pull the battery out and charge it overnight. While you have it out, check the fluid levels in each cell. Fill the cells that are below the recommended level with distilled water. Consider purchasing a new battery if it’s more than 4 years old. It’s easier to change a dying battery now than fuss with charging it and hoping it still works later. Tires Look over your tires carefully. Cracks in the rubber, flat spots or nails and screws that may have punctured holes mean it’s time to get some new ones. Also, if you see exposed wire or metal meshing coming through the tread, it’s definitely time for some new rubber. If you don’t see any of these red flags, check the tire pressure and make sure they’re properly inflated. Belt or Chain A broken belt or chain can strand you at the side of the road. Take a few minutes to inspect them for wear and weak spots; replace the belt or chain if you find any damage. It doesn’t hurt to check the tension, either, and make sure it’s up to the manufacturer’s specs. Spark Plug Depending on what type of motorcycle you have, a spark plug can be an easy roadside change. However, if you own something like a Suzuki S40, it’s best to check it beforehand. A spark plug change on that motorcycle is not a simple fix because the seat and gas tank need to be removed. A spark plug costs a few bucks, and it’s better to check and replace it now than wait for it to fail in the middle of your next trip. Battery If you haven’t started your motorcycle all winter, pull the battery out and charge it overnight. While you have it out, check the fluid levels in each cell. Fill the cells that are below the recommended level with distilled water. Consider purchasing a new battery if it’s more than 4 years old. It’s easier to change a dying battery now than fuss with charging it and hoping it still works later. Air Filter Proper airflow into the engine ensures that it runs smoothly and efficiently. Filthy air filters prevent oxygen from entering the engine; thus the combustion process that runs your motorcycle can’t occur. Pull the filter out and hold it up to a light source. If you can’t see any light through it, you need to replace or clean it. Fluid Levels Stand up your motorcycle so it’s completely level to ensure accurate readings of the oil and brake fluid levels. Check the brake fluid first. Start by covering your gas tank with a cloth or towel because brake fluid can damage the paint. Most motorcycles have a little window on the front of the reservoir indicating the fluid level. If it’s on the low side, open the reservoir and top it off. Maintaining the engine oil level is, in my opinion, one of the easiest and most inexpensive ways you can prevent major engine repairs down the road. Low oil levels prevent proper lubrication. Lack of oil prevents parts from moving smoothly, which causes heat friction and can ultimately destroy your engine. Your local motorcycle mechanic will be more than happy to replace the engine but it may cost a few thousand dollars. Brakes Aside from checking the oil, taking a second to look at your brakes can save you a lot of money down the road, too. Letting your brakes wear down to the metal part of the pad destroys the disks, which can cost a pretty penny to replace. Most brake pads have a notch on the top to track its wearing. If you don’t see the notch at all, it’s time to replace the pad. Lubricate the Cables Over time, brake and clutch cables can wear down and fray. If either breaks, you’re in serious trouble. Look at your motorcycle maintenance book and figure out how to detach the cables from their housings on the handlebars. Once you can access the cables, apply cable lubricant and let gravity do the rest of the work. Lights It only takes a second to check that your signal lights, brake lights and headlights work. These lights communicate your moves on the road to other drivers and help you stay safe on the road. Now that the hard stuff is done, you only have a few more things to do. My bike gets kind of dusty from sitting all winter, so I always give it a bath and a thorough wax job before hitting the road. Not only does wax bring out the pristine, just-off-the-shop-floor look back to your paint and chrome, it also protects your bike’s paint job from the elements, helping it last longer. Lastly, make sure to check out all your riding gear to ensure it’s in tip-top shape. Worn boots, scratches on your helmet visor and holes in your gloves may not protect you as well or may even impede your riding abilities. Your gear is the only thing protecting your skin from the pavement. The least enjoyable thing about owning a motorcycle is getting stuck on the side of the road – especially if a little maintenance work could’ve prevented it. You can more than likely avoid that from happening by taking a few hours one afternoon and performing a thorough checkup on your motorcycle. Ride safely this season!